I’m so excited to announce some upcoming events that we have going on. From calligraphy workshops to craft fairs, Dixie on Dallas will soon be seen more around San Diego than ever before. Below are events that I will be at (they won’t let me bring Dixie so I’ll be flying solo on these). That’s right, you heard me correctly – calligraphy and craft beer. 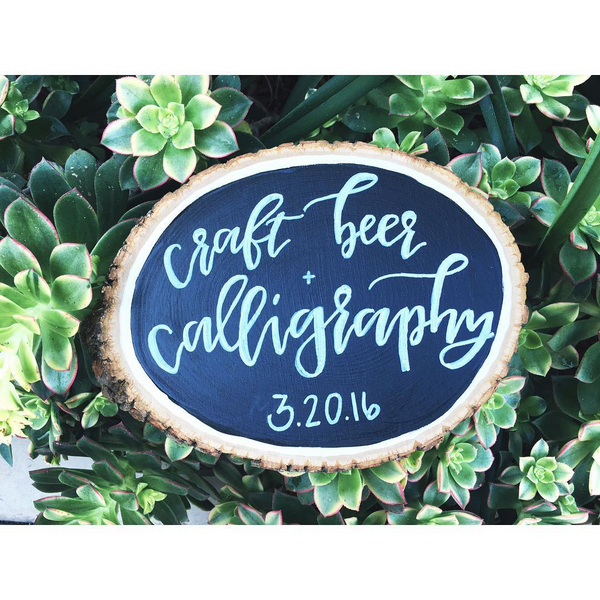 I will be teaching a modern calligraphy workshop at Societe Brewing with Women’s Craft Beer Collective. The class includes 2 beers from Societe Brewing, a modern calligraphy workbook and instructional manual, practice book, a take-home wooden chalk board sign and pen, and light apps. Starting at 1pm, tickets are $55 each and available up until the beginning of the workshop. For more information and to purchase tickets, please visit Women’s Craft Beer Collective. My first ever craft fair! 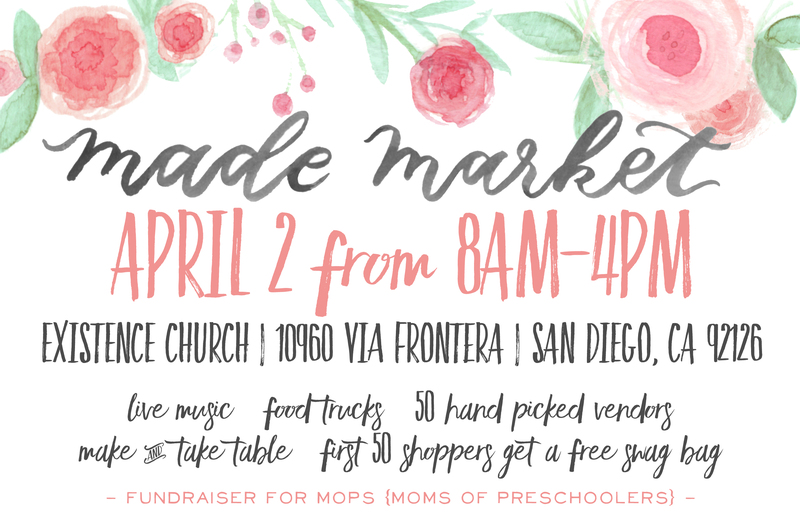 I’m so excited to be joining the Made Market family this spring. Their show features all handcrafted small businesses. Many vendors and items for the show are geared towards growing families, especially those with littles. Located at Existence Church in Rancho Bernardo. Tickets are required for entry with proceeds going to Existence Church’s MOPs program (Moms with Preschoolers) which helps aid scholarships and childcare costs. Tickets are $3 for adults, kids and military are free! 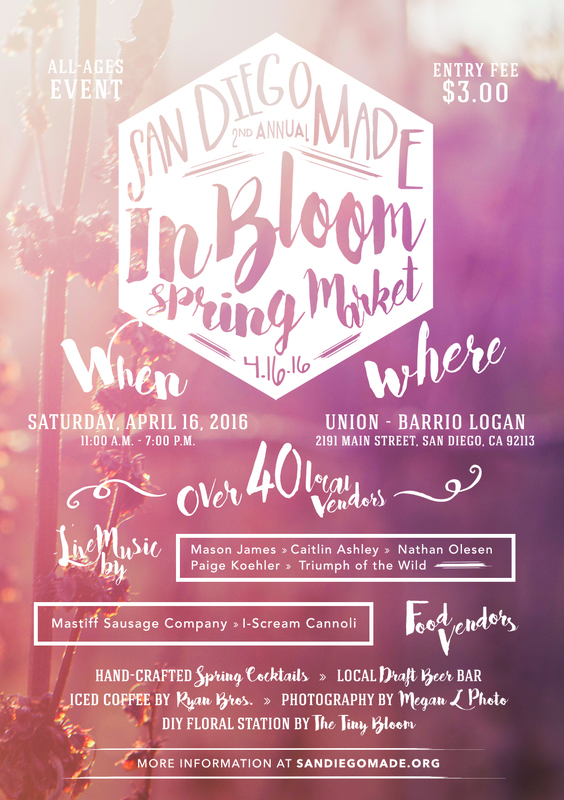 Focusing on local, hand-made artists from the San Diego area, San Diego Made’s 2nd Annual In Bloom Spring Market will feature over 40 local artists (yours truly included), live music, and food trucks. This exciting shopping and cultural event can be a great source of inspiration for your locally-sourced wedding ideas and hand crafted goods. Located in the heart of downtown Barrio Arts District at Union. Tickets are required for entry to the event, kids under 12 are free. Tickets are available now and can also be purchased the day of. The first 75 people in will receive a free swag bag with goodies donated from participating vendors! For any questions on events, please reach out! I’m so excited to be partnering with these wonderful organizations throughout San Diego to spread my love for calligraphy, design and all things DIY! I hope to see you at all these events coming up! © 2015 Dixie On Dallas. All rights reserved.